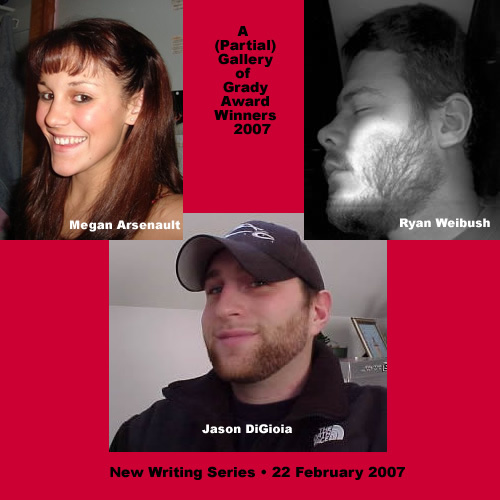 On 22 February 2007, the New Writing Series will host a reading by this year’s winners of the Steve Grady Awards in Creative Writing. Check out their bios, below, and be sure to come by to celebrate their accomplishment Thursday at 4:30pm in the Soderberg Auditorium on the UMaine campus in Orono. Polaris Garfield is a 4th-year English major with a concentration in creative writing and a political science minor. She transferred to the University of Maine in 2005 from San Diego State University. Polaris lives in Orono and works as a tutor in the UMaine Writing Center and also as Head Copy Editor for The Maine Campus. She is currently working on two collections of poems, one of which comprises her submission, “Rainy Day Poems” (first prize undergraduate poetry). After graduation, she plans to pursue a career in editing and publishing while continuing to write poetry and fiction.